Halloween spells usually involve divination or contacted spirits, given the nature of the world at this time of year. If you are just looking for a Samhain ritual to honor the holiday, I have something else that might suit better. 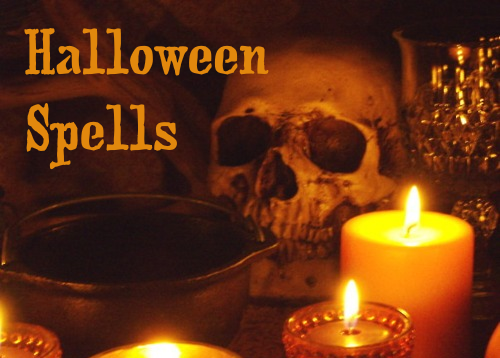 Otherwise, here are two classic Halloween spells for your Sabbat plans this year. If you want to take advantage of how near the spirit world is at this time of year, this is a spell to help you contact a deceased loved one. You should do this spell right on Samhain night if you can. Use some string or thread to tie the rosemary and bay leaf to the top of the mirror, so they are hanging in front and can be seen in the reflection. Dab patchouli oil on your thumb and draw a large circle on the glass. Then sprinkle a line of dried patchouli in front of the mirror. Now that your mirror is prepared, you can start your spell. Turn off all the lights and work only by the candlelight of your black candles. Hold the photo or other item in your hand and sit in front of your mirror, behind the line of dried patchouli. Turn the item so it's reflected in the mirror and you can see it clearly. Focus your thoughts on that person, and send out thoughts that you want to contact them. Let your mind wander a little, and concentrate on the area of the mirror where you drew your circle. A message should soon appear. It won't be a literal image on the glass, but more of an image in your own mind. The images will likely be a little confusing as this type of communication can be abstract or symbolic. The next spell lets you try a little Samhain divination for the upcoming year. Rather than try to teach you something complicated like Tarot, we'll stick with something simpler. A little pendulum divination spell is perfect for Halloween. You'll need something to use as a pendulum. A weighted object on the end of a piece of string or chain will work just fine. If this is your first time doing pendulum divination, sprinkle a little dried mugwort on the table surface to help you get your psychic skills moving. Let the pendulum hang from your fingers (over the mugwort, if you are using it). Wait for it to be still. Concentrate on the upcoming year and ask the pendulum a simple yes/no question that you already know the answer to. That will show you how the pendulum responds to you. It will spin or circle one way or the other to show you yes or no. Once you figure out how your pendulum is talking to you, ask a few yes/no questions about the events coming up in the year and see what insights you can discover.